Allow me to share with you a life-shaping story I found recently. I found this while reading a book by Max Lucado entitled In the Eye of the Storm. “Clovis Chappell, a minister from a century back, used to tell the story of two paddleboats. 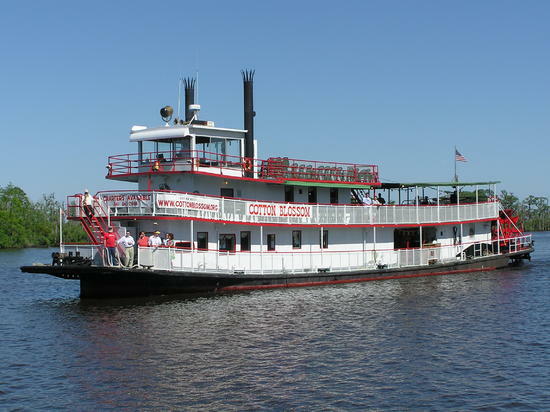 They left Memphis about the same time, traveling down the Mississippi River to New Orleans. As they traveled side by side, the sailors from one vessel made a few remarks about the snail’s pace of the other. "Words were exchanged. Challenges were made. And the race began. Competition became vicious as the two boats roared through the Deep South. I admit stories like this make me uncomfortable. I’m a type ‘A’ person. I like to go from A to B. I’m not by nature a ‘stop by the side of the road person and smell the flowers’ type of person. There’s stuff to be done, mountains to climb, and races to race in and victories to achieve. I’m not competitive with others. I don’t like to underachieve. My race is with myself. However, I see the point Lucado is making. I have no desire to burn my cargo to win the race. It’s OK to say no to the important to say yes to the vital. It’s OK to say 'no' to a good opportunity to say 'YES' to a better opportunity. My wife Becky helps me in this. When it comes to helping others I’m reasonably wise. When it comes to myself, I have the wisdom of a turnip. Sound familiar? I minister and speak all over the world. There is most always someone inviting me to come to their church or conference. It’s wonderful. It fuels me. But, good things taken to extremes can become bad things. There are times when the vital comes along. I have given Becky the responsibility of telling me, “Ed, that’s too much, you are going to be gone for too long, for too often, you’re going to miss something with our family or me that is more important.” In other words, if left to myself, I will burn the cargo to win the race. Thank God for the Beckys that bring people like me back to reality. Jesus did this. Many times, he could have gone on healing, gone on feeding the poor, gone on teaching, and gone on doing good stuff. But there were other times, He dismissed himself from the crowds. Why? He needed to pray. Jesus wasn’t selfish. He knew what was vital when it was vital. Life consists of two main elements: relationship and task. We can be high relationship/low task. We will like everyone and everyone will like us but stay in Memphis. Then there’s high task/low relationship. We will get to New Orleans but burn our cargo, forcing everyone else to jump into the Mississippi and swim for their lives. Then there is low relationship/low task. We will never get out of Memphis and everyone else will be gone. They boarded another boat to New Orleans. The last option is what Jesus did. We can be high relationship/high task. We will run our own race and still have heaps of people and cargo on board when we arrive in New Orleans. My advice for a quality life: When handling others, use your heart. When handling yourself, use your head.